During March 2011, I spent two wondrous weeks on a solo trip to Italy. I stayed in a quaint hotel located inside this little Italian woman’s home in the heart of Rome, moments away from the Trevi Fountain and Piazza Barberini. 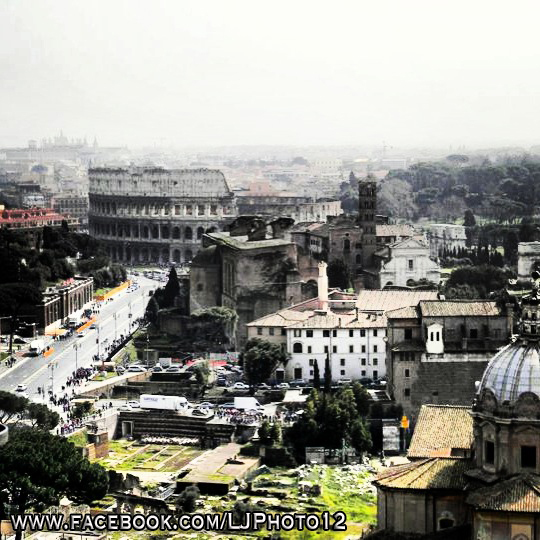 Rome is a city rich in religion and faith; in fact, if you can quiet your mind from all the hustle and bustle of this popular tourist destination in Europe, I’m sure you can hear the voice of God. Amid the ancient ruins, tons of museums and other tourist destinations, Rome is filled with over 500 glorious churches, mainly Catholic. Each one of these churches is an art gallery of sorts, showcasing beautiful paintings, mosaics, and sculptures from some of the greats such as Michelangelo, Bernini, and Raphael. I spent my first few days in Rome just aimlessly wandering the streets of this magnificent city that I wanted to see since I was a teenager. I took three years of Latin and studied Roman History in high school and college. There were so many amazing sights to burn into my memory; it was hard to believe at times that I was actually there, walking the same roads as the Caesar’s once did! 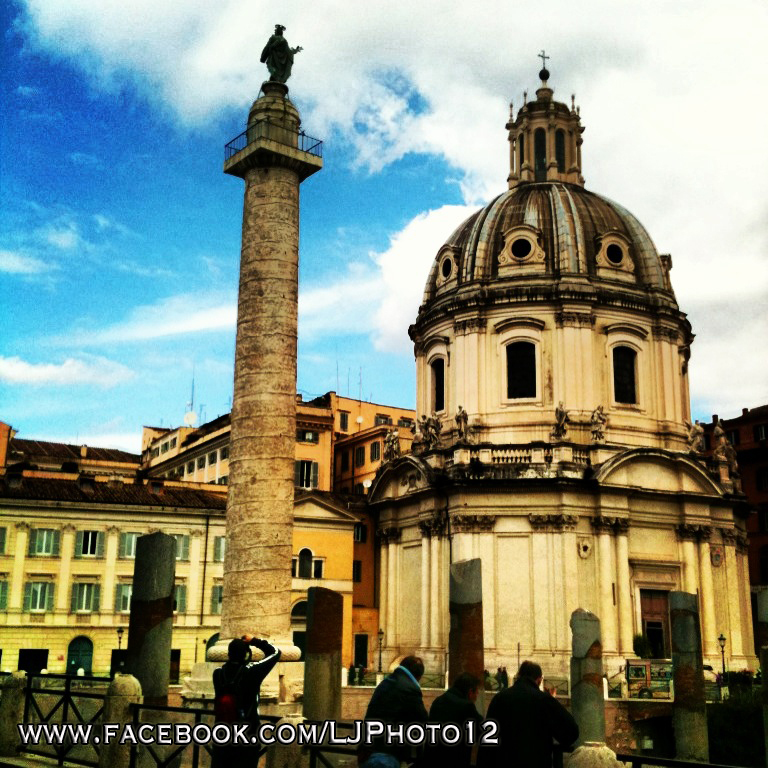 When I finally made my way down to Via dei Fori Imperiali, one of the main roads in the historical center of Rome, I was awestruck. There standing magnificently in the distance was the Colosseum, with the Roman, Caesar’s, and Trajan’s Forum triumphantly leading the way down the road. I had to pause for a moment to take it all in. Pulling out my journal and a pen from my travel bag, I started to record my thoughts. Being caught up in the moment, a few annoying street vendors started to bother me, asking me to buy some of their cheap souvenirs. After telling the vendors over and over, “No grazie!”, I gathered my things quickly and changed location; but alas, they found me once again. Street vendors are very persistent in Rome. Needing an escape from the vendors and a quiet place to collect my thoughts, I decided to duck into a church. The Santa Maria di Loreto, right outside of Trajan’s Forum, was the perfect place; it was modest compared to the illustrious Saint Peter’s Basilica just up the road in Vatican City. This was the first church I entered in Rome, in addition to the first church and spiritual center I had been inside for many years. The moment I entered the sanctuary, I felt a warm wave of energy wash all over me, both inside and out. I felt at peace; I couldn’t remember a time in which I had felt so calm and collected as I did at that moment. I slowly walked around the sanctuary, admiring in awe the wonderful art that adorned every square inch of this church. It was there, inside this 16th century Catholic Church that was magnificent with beautiful artwork, in which God made its presence known to me – my faith started to return. I made my way to one of the ornately carved wooden pews and bowed my head in meditation; I sat there for about 30 minutes reacquainting myself with spiritual energy and connection. 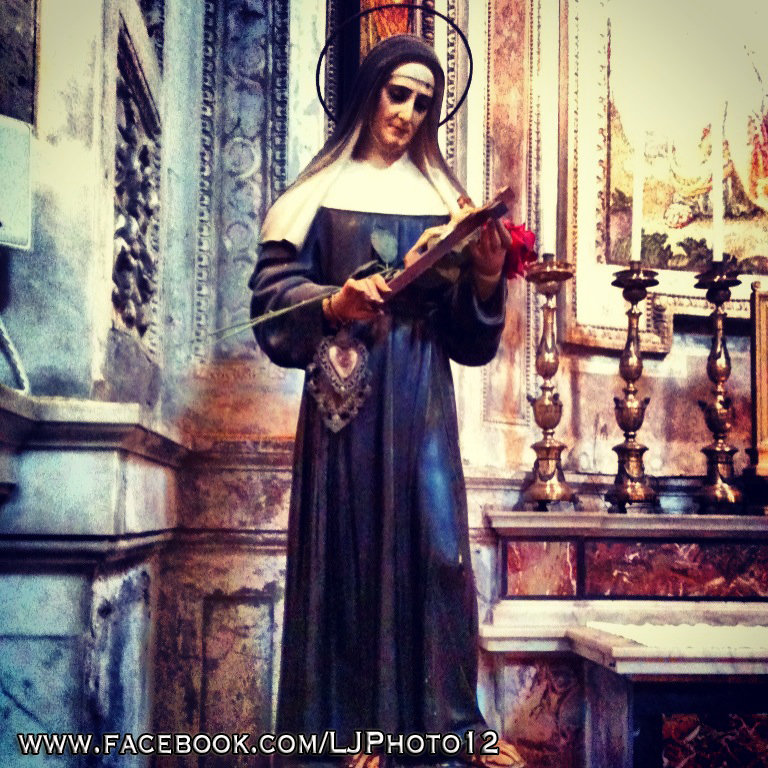 While I was in this church, I found myself strangely drawn to this statue of Saint Rita standing in one of the prayer areas; I stood in silent meditation just gazing at her. I had visions of a happier, more fulfilling and blessed life; traveling the world and feeding my soul what it so longed for. I snapped a photo of St. Rita with my iPhone before leaving, just to remember the experience and hopefully, to garner some of those feelings I experienced in her presence. I later discovered that Saint Rita is the patron saint of abuse victims, against loneliness, and of desperate causes – how àpropos! My life back home in Ohio looked great on the outside and well put together; here I was in Italy on my own, a trip I planned for months, my trip of a lifetime. I had people telling me daily that they envied my life. If they only knew that inside I was a wreck; I was one bad relationship away from either ending it all or getting a house with fifty cats and calling it a day. My faith not only in myself when it came to relationships, but also my faith in ever finding a decent man started to reignite. Was it Saint Rita working her mystical magic? Perhaps. While I am not Roman Catholic, having this saint enter into my life at that time was a segno di Dio (sign from God). It felt great to have that life-giving transfusion of returning spirituality in my soul. I knew that this was just the start of many good things to come from my two weeks in Italy.